He was an unknown cabaret singer who became a household name as 1970s cop. Now rejoining the cast of Last Tango in Halifax, Dean Andrews talks to Sarah Freeman. For someone who had no intention of being an actor, Dean Andrews has notched up some impressive roles. Since he was cast in Ken Loach’s 2001 film The Navigators about a group of northern British Rail workers struggling to cope in the aftermath of privatisation, he has become something of a cult figure thanks to playing DS Ray Carling in both Life on Mars and Ashes to Ashes, had viewers on the edge of their seats as a man accused of murdering his terminally ill girlfriend in The Case and starred in the life affirming Victoria Wood musical The Day We Sang. “Ken wanted to cast northern actors and he got in touch with various agents and my name came up,” says Barnsley born Andrews, who until 15 years ago was a largely unknown cabaret singer. “I auditioned, got the part and a few weeks later I was on the set. I didn’t know any better at the time. Having never acted before I thought all directors worked like him, but 15 years on, and with quite a few more parts under my belt, I realise how special it was. Andrews was in his late 30s when he made his acting debut, but he was no stranger to performing having cut his teeth on the South Yorkshire club circuit before graduating to holiday resorts and cruise ships. By the time he was 17 Andrews, who still lives in South Yorkshire with his wife and two daughters, was taking his own first steps into the entertainment business. However, despite having performed with the Phoenix Amateur Operatic Society he says becoming an actor never entered his head. After The Navigators, Andrews, who will be back on the small screen tonight in the first of a two part Christmas special of Last Tango in Halifax, had small parts in the likes of EastEnders, Casualty and Clocking Off, but it was the landmark drama Life on Mars which made him a household name. Ah yes, Wainwright. If it’s a large dollop of festive cheer you’re looking for, the Huddersfield-born writer is probably not your woman. 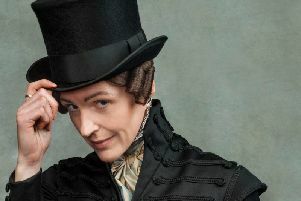 This Christmas, the Happy Valley creator will see the premiere of her new Brontë drama, which (spoiler alert) ends badly for all concerned and before that there’s Last Tango in Halifax there’s not an awful lot of traditional merriment. It’s been two years since the last series ended and while this two-parter is billed as a festive special it’s noticeably short on tinsel and trimmings. Sarah Lancashire’s character Caroline is still coming to terms with the death of her partner Kate, Gillian, played by Nicola Walker, is still feeling guilty after killing her abusive first husband and passing it off as suicide and stress levels are invariably high. “It has got laughs, but like the majority of Sally’s work there is a gritty reality to it,” says Andrews, who plays Robbie. “When we meet him again he has retired from the police and he’s helping Gillian, who was his sister in law, but who is now his wife, with the farm. Or at least he thinks he’s helping her. She is finding it a bit irritating having him around all the time. “But that’s real life isn’t it? People have ups and downs, for most us life is a bit of an emotional roller coaster and that’s what Sally is so good at portraying. Like much of Wainwright’s work, this latest two partner was filmed in Yorkshire, which was also a bonus for Andrews as it meant he could go home at the end of a day’s shoot. Andrews will also be home this Christmas, but he is already booked to fly out on December 27 to join a cruise ship in the Caribbean where he will spend New Year entertaining the passengers. “It’s a pretty good gig. People like seeing someone they recognise from the television, but I can’t say it’s arduous work. You sing for an hour, four or five times a day and then you get to enjoy the ship. “When I look back on the last 15 years it is pretty surreal, but I do know that for the last couple of years I have let the acting drift a little, so if I have one New Year’s resolution is to work at it a bit harder in 2017. I really enjoy the singing and it’s been a good career, but right now I think it would be a good time to concentrate on the acting. “I’m not someone who has any regrets. I’m 53 now and even had I gone to drama school when I was younger I’m not sure I could have gone any further in my career than I have now. After Life on Mars I suddenly found that lots of doors were open to me. It’s really thanks to that part that I am now approached to do voiceover work and without it, who knows whether I would have landed Last Tango in Halifax.